My earliest memories of pancakes are my dadi’s (paternal grandmother’s) “meetha pudas”. 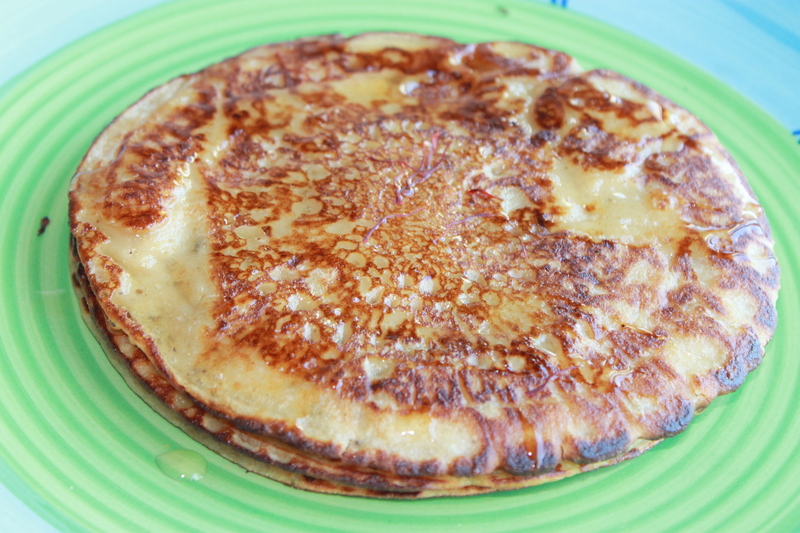 They are eggless, whole-wheat pancakes laced with Indian spices and cooked in ghee (clarified butter). Reflecting on these pancakes conjures up several food memories of my childhood that are often centered on my grandmother’s cooking. My grandmother embodied the very concept of “Feeding Your Appetite”, expressing the depth of her love through her cooking. I believe that my innate desire to cook for the ones I love is something I inherited from her. Unfortunately, my grandmother never experienced the birth and development of my culinary passion and I never had the opportunity to cook for her. Since my blog is just a week shy of its 6th month anniversary, I wanted to share a recipe that could have played a small part in developing my culinary zeal. whole-wheat flour and eliminating the eggs creates a healthier alternative to traditional pancakes. I use lesser sugar in the batter in order to add honey in the end, which really augments the flavors of the Indian spices. These pancakes are perfect for a nourishing breakfast (or after-school snack) and are a remarkably delightful way to show someone how much you care. Cardamom powder is readily available in all grocery stores. In case you only have whole cardamoms pods at home you can easily make cardamom powder. In a mortar with a pestle break apart the cardamom pods and discard the green skin. Use the pestle or a coffee grinder to powder the seeds of the cardamom pods. 1) Crush the saffron with your fingers and add it to the warm milk. Mix it and set it aside for 10 minutes. 2) While the milk and saffron is set aside, you can start making the rest of the pancake batter. In a large mixing bowl, mix together the whole-wheat flour, baking soda, sugar, cardamom powder and fennel seeds. 3) Add 1 cup of milk and the saffron and milk mixture to the dry ingredients. Stir all the ingredients well but do not over-mix – it is okay to have a few lumps. If the consistency of the batter is too thick then add in the remaining ¼ cup (or some part of it) to this batter. 4) Heat a skillet or a griddle to medium-high heat. Heat the oil in batches and add 1/4 – 1/5 of the batter in the center of the skillet and spread out to make a round pancake. Cook till brown on both sides and the insides are fully cooked. Repeat this process till all the pancakes are made. 5) Serve hot drizzled with a good quality honey.